So What Is Our Favorite…? If you’d like to contribute to help the people of Nepal recover from the devastating earthquake, please visit our page collecting some worthy causes. 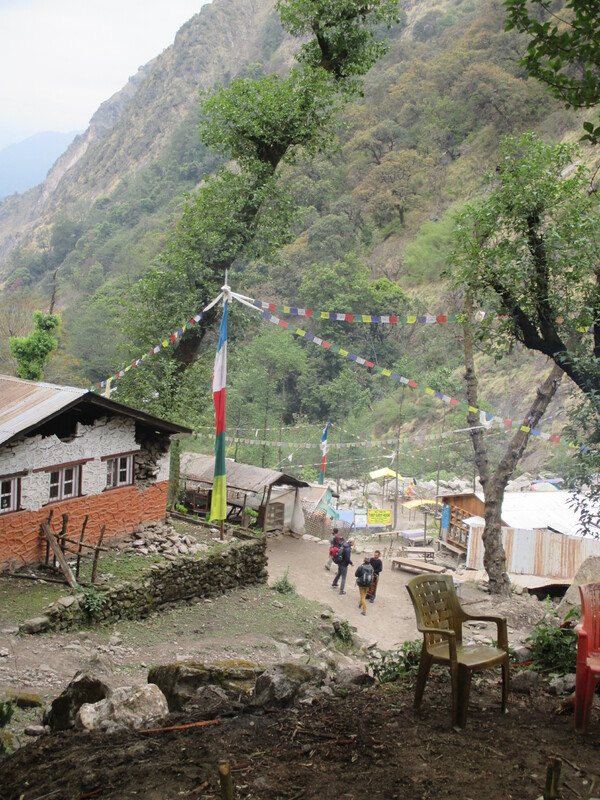 We woke up in our makeshift camp above Bamboo Village on the morning of April 27, two days after the large earthquake that rattled Nepal, with mixed emotions. On one hand, we had a solid night of sleep and were feeling refreshed. On the other, the messages coming through the satellite messaging device were still pessimistic about a rescue being sent for us any time soon. One thing we saw firsthand during our experience was how easy it is for fear and even panic to spread through a group in a survival situation. It was clear on this morning that the locals were still not feeling safe in our shelter area. They would motion up towards rocks higher up both sides of the canyon walls, and indicate that they thought that a landslide could reach what we considered to be our safe space. This sense of dread spread through the rest of us and we all began to wonder if it made sense to stay or whether we should go somewhere else. We talked it out and try to think about it scientifically, and it seemed like logically we were in a good situation. 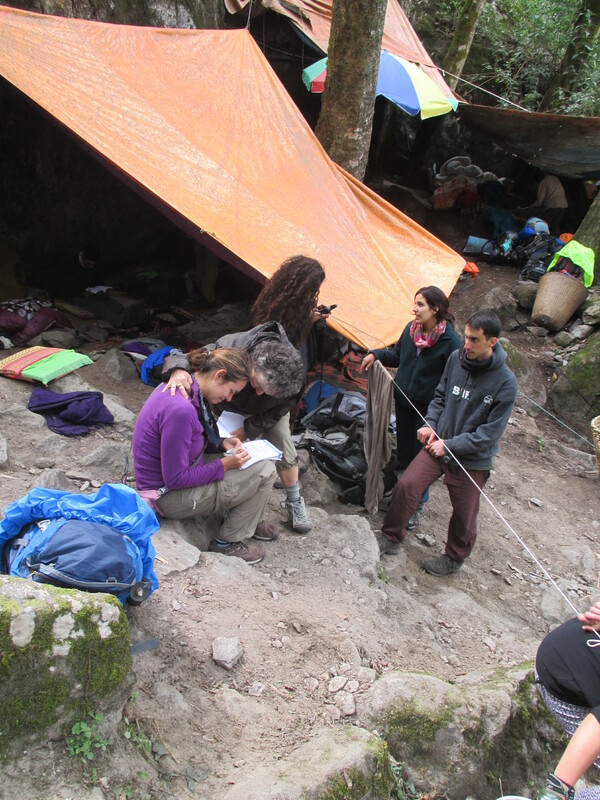 It looked like landslides would be funneled away from our shelter. Also, we had plenty of food and shelter from the elements, and we didn’t know what it would be like elsewhere. So our initial reaction was to stay. But then it came out that the villagers thought it was safest to head to higher ground, improvising a path up the canyon wall to head to the village of Thulo Syabru. Again we questioned whether we should follow our instinct to stay or follow theirs to go up (especially since they had been almost right about the aftershock the previous day). A few of the guides thought that the locals were right, and headed up with them along with their clients. The two of us though decided to stay with the larger group. We felt our decision was somewhat vindicated when after an hour or so the guides and trekkers returned; the scramble over the rocks to get up the canyon seemed too tough. (We did later hear that those who continued on made it safely). Around the same time a smaller contingent – one guide and two brothers from Lithuania – decided to head down the trail back to Syabrubesi. This was a bit more appealing, because we knew that Syabrubesi was a sizable town with a road link back to Kathmandu (although we didn’t know the condition of the road). 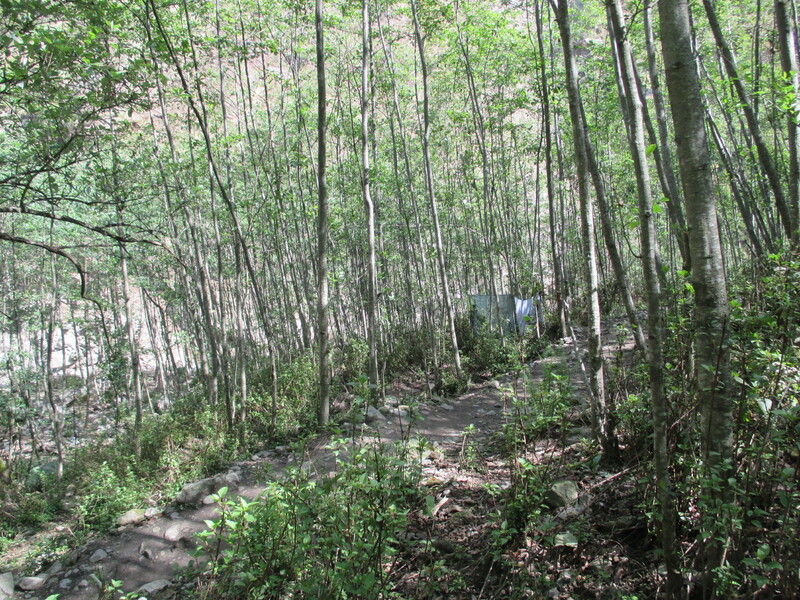 We might have been more tempted by this option, but many of the landslides that we had seen during our time sheltering had hit sections of the trail that we would have had to hike through. It seemed like an unnecessary gamble given that we had our necessities taken care of at Bamboo. Still, it was quite tough to make the decision to stand still when we had no clue how long we would have to wait for helicopter rescue. The main group stayed, including the Israelis with the satellite messaging device, so we stayed too. (We did later learn that those who walked down made it safely, but ended up having to walk two more days until being able to catch a bus to Kathmandu). After all of the departures, we had a full group meeting to discuss our updated situation. During this meeting we discussed what projects needed to be done around camp, and made sure everyone was updated on what messages from the outside world had been received. We briefly brought up whether we should establish a priority order for evacuation, but it seemed the consensus was the wounded and older first and we didn’t go much beyond that. We also went around the group and introduced ourselves – even though we all felt like a team already, we had missed some introductions in the heat of the moment and it was nice to get a chance to hear everyone’s names again. We also counted off – we were 47 people. Again, it felt like we had been through a full day and it was still the middle of the morning. We still had a big chunk of the day to get through, so many of us started to work on projects that had been identified in the group meeting. One of the biggest projects was water. Among the group we had a sizable amount of purification supplies, but we had made the decision that we should conserve those for later and boil water while we could. We had realized that with as many people as we had, we needed a large volume, and it was hard to boil that much water when having to share the fire with meal preparation. Therefore, the first task was to construct a second fire that would be constantly boiling water. They ended up making two small fires just big enough to accommodate the large kettles we were using. The boiled water was safe to drink, but it still looked pretty murky. The clear mountain rivers had turned a muddy brown after the landslides, and it resulted in a pretty gritty drink. A few people came up with a way to filter the water by using gauze stuffed into the tops of water bottles with the bottoms cut off. Running water through these filters would remove many of the particulates. They even came up with a great system where four filters could run at once. The next issue with the water was that the boiled water was too hot to put into the plastic water bottles for storage, as they would just melt. Someone had the idea to cool the water by running it inside a hose that was in cold water – we think we heard this was based on a beer cooling system! A rubber hose was found, and then a system to run it downhill through a bucket of cold water was set up. This was a cool system, but then another limitation became apparent: it could only fill one bottle at a time. With 47 of us, that seemed pretty tedious. Then, one of the Israelis, Yonathan, began to construct a “bottling” station. At first we were confused, but the end result was quite impressive. He set up a platform that the hose would run over horizontally, and then poked small holes in the hose for water to drain out into bottles. He even fashioned small straws out of bamboo to direct the drips. With this water system up and running, there was a need to go get water to boil more frequently. The whole group was pretty good about jumping up and helping, and we took a few turns ourselves. 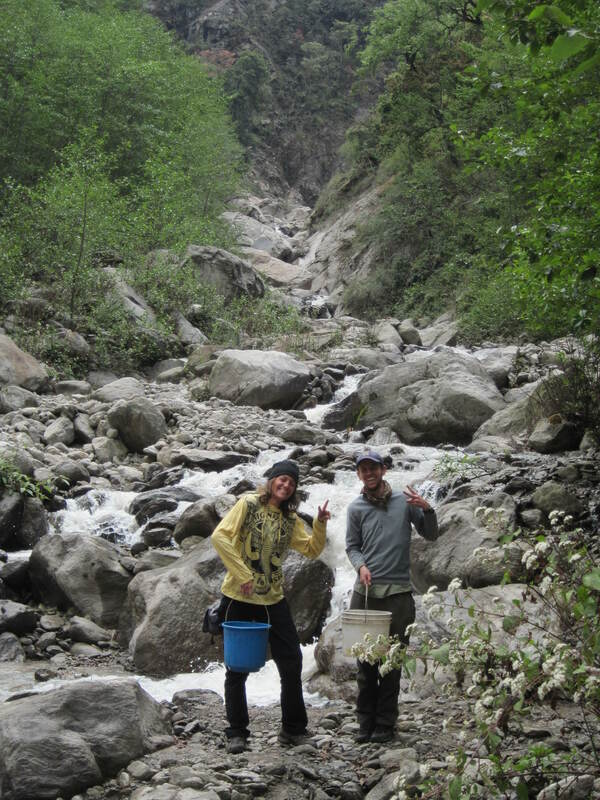 It was actually easier to get the water from a side river just up the trail rather than from the big Langtang River. We were still concerned with making contact with the outside world. The holders of the satellite messaging device had figured out how we could send an email to any address, so some of us started sending messages to our loved ones to see if they could work a rescue from a different angle than the Israelis. The two of us were able to get a message out to our families with insurance information in case that helped. The messages had to be 160 characters or less so we worked hard to squeeze as much as we could in. A few of the guides also decided that our helipad on the beach might not be enough, so they cleared some of the nearby eating terraces and created two new helipads – giving us three in all! They marked the “H” on these with flour – which seemed like a good idea until the cows that also lived in the village started to eat it. Another group formed and moved the location of the latrine. The original latrine had been nice but was in a location beneath the area of one of the original rockslides, so it was always a bit scary to use it. They moved it to a location in the flat area above our rock that had so far been untouched. Even with all of these projects, there is so much time in the day that we had to find ways to fill. There were a few diversions like playing cards, singing songs, and reading, although we personally found it a little hard to focus on things for too long. Most of the time was filled just sitting around and chatting with one another about the situation we had found ourselves in. We were graced with another sunny late afternoon, and again it helped to lift our spirits. The group of Israelis volunteered to cook dinner, and they made an excellent shakshuka. As the sun set, we were able to get our old sleeping spaces back and snuggled back in with our same “roommates” from the previous night. It had been a good day with a lot accomplished, but we were still anxious about just how long our camp improvements would have to last us. Was rescue coming soon, or would we have to walk out like the others had? We will continue to tell the story of our earthquake experience in Nepal. We were extremely fortunate to survive and to be able to come home to the USA. 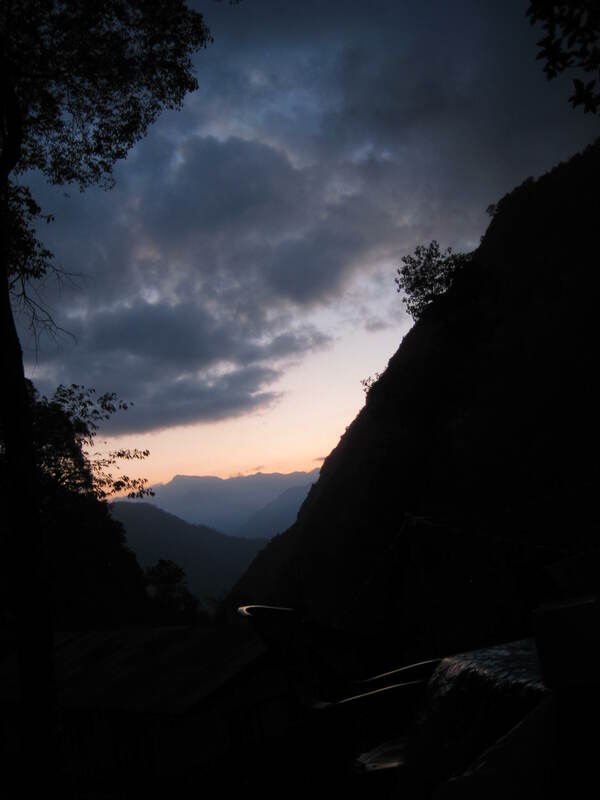 Our stories are now over, but those in Nepal are not that fortunate. Huge numbers of people have lost their homes and their livelihoods. Please take some time to donate (any amount, large or small, can help) to help this beautiful country recover. We’ve collected list of organizations that you might consider here. Sounds like you were well organzied. I think the group dynamic is the mnost interesting. It seems it could have been very different.